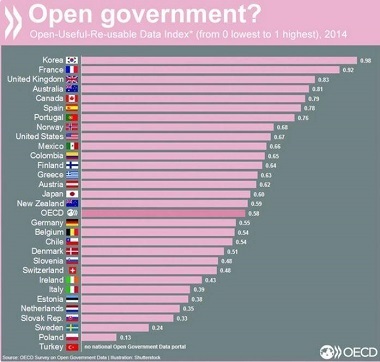 Interesting to see that Switzerland is below the OECD average concerning how open, useful and reusable government data is. We certainly hope to contribute to increasing our rank by opening all our data to the public at the WSL in the next years. And not only opening the data, but also making it reusable and easily accessible. One of the main objectives of my data scientist position at the WSL is to publish our long-term monitoring data in a way that every researcher can use it. Project that are running here are called ENVIDAT and smartforests.io. Stay tuned for updates here on my webpage or on https://twitter.com/matthista. The full OECD report can be read here: http://bit.ly/1OCbPW9 or here: https://www.linkedin.com/hp/update/6097734662422093824.